Cedar Bridge Park, managed primarily as day-use historic site and picnic area, is home to one of the six remaining covered bridges in Madison County, with Cedar Bridge being the only covered bridge that you can still drive your vehicle through. Cedar Bridge Park is adorned with two quaint Victorian era gazebos, brick walkways and a courtyards bordered by a wildflower garden that are often used for weddings. Cedar Bridge, built in 1883, was destroyed by fire in the fall of 2002. Through a ground swell of public support, funds were raised to rebuild Cedar Bridge. The exact replica of Cedar Bridge was built and dedicated on Saturday, October 9th, 2004. In April of 2017, Cedar Bridge was again destroyed by arson. Current fund raising efforts for rebuilding Cedar Bridge have generated over $500,000 in donations and grants. Reconstruction of the bridge is likely to begin sometime in 2018. 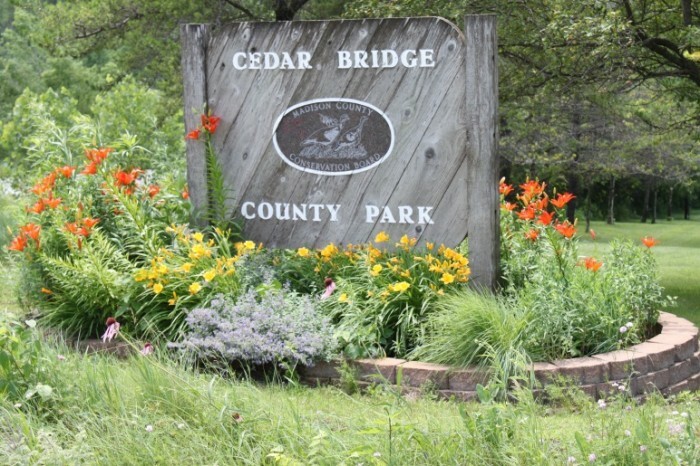 In May of 1993, Cedar Bridge Park hosted Oprah Winfrey when she aired her daily television talk show from the park as a means to promote a book that she dearly liked at the time which was entitled, “The Bridges of Madison County.” Although only 27 acres in size, Cedar Bridge Park receives heavy daily tourist traffic with the peak season coming in the fall during Covered Bridge Festival weekend (2nd full weekend in October). Landscape beds of colorful perennial and annual plantings are located at the entrances to the park. Picnicking: Picnic facilities are available in the two shelters. The Gazebos are nestled within stands of pines and deciduous trees and accented with brick patio gardens that are landscaped with tiered beds of perennial and annual plantings. 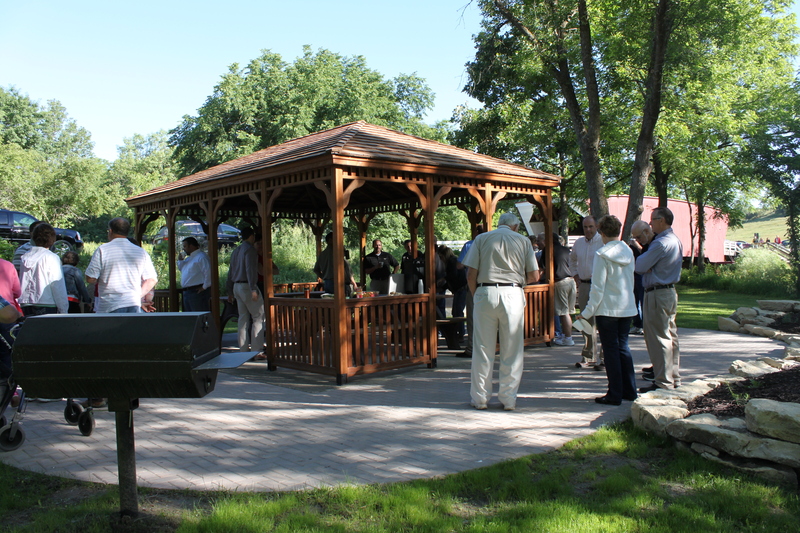 The north Gazebo is handicap accessible made possible with hand-laid brick walkways. 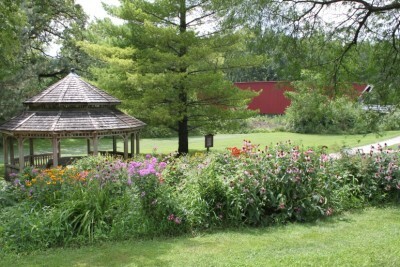 Weddings: Many couples utilize the Gazebo’s patio gardens as a wedding locations in association with the Covered Bridge. For Gazebo reservation fees and policies see Shelter Houses. 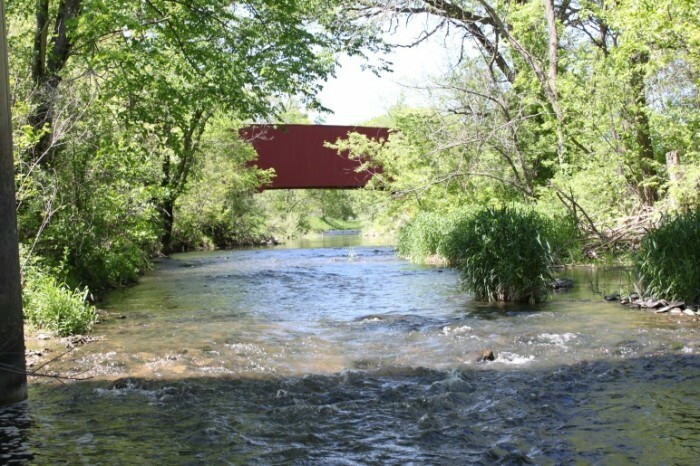 Cedar Bridge Park is located 3 miles northeast of Winterset on Cedar Bridge Trail. From Winterset, travel ½ mile east on State Highway 92, turn north on Cedar Bridge Trail for 1 ¾ mile. Route is marked by standard County Park arrowhead roadside signs on Cedar Bridge Trail.